Slideshow: The muscle-bound drifter breaks boundaries between two worlds...and comes to a point in a cloud of rubber vapor. The Toyota AE86 was positioning for greatness long before we got our hands on her. By her very design, she was already destined for a page in tuning history. The front-engine, real-wheel-drive configuration was held for the design, despite the increasingly popular front-wheel setups that were becoming commonplace at the time of its production. 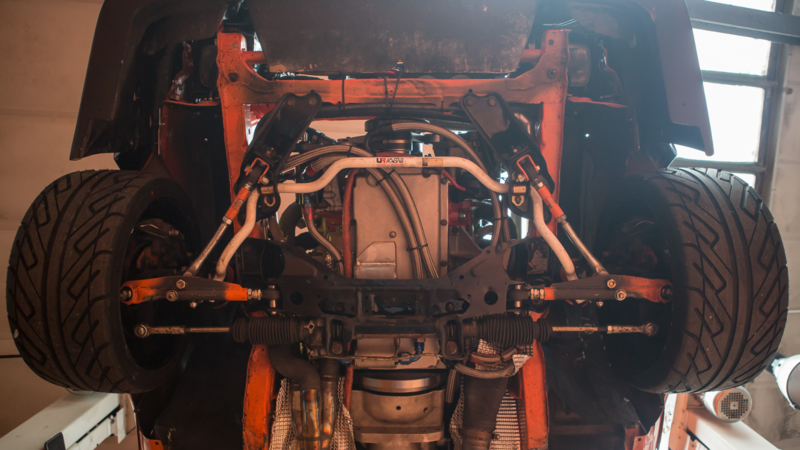 Ventilated disc brakes, MacPherson-style struts, independent suspension; the car had a lot going on for itself! Indeed, all she needed was a motor, really. Sprinkle Some Driftworks On It, Johnson! The Driftworks mission extends beyond excessive angles of rotation around corners (although, that's a major part of it). 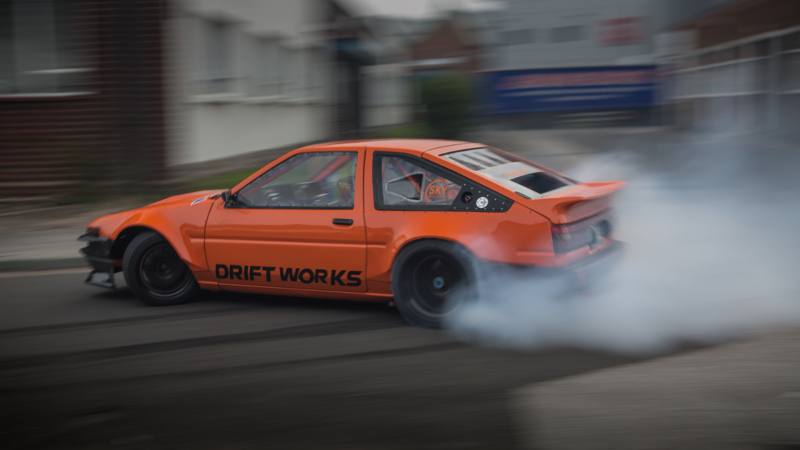 Driftworks was founded on enjoying all that a car could be, not barred by stereotypes and conceptions. This car may make purists sick to their stomach to learn that the 454cid LSX motor came from a General Motors' production plant, but that's just because they haven't seen the AE86 in action...yet! 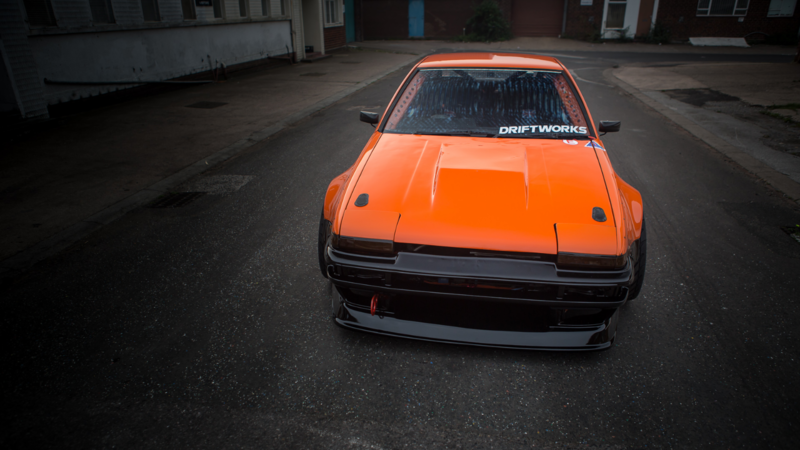 >>Join the conversation about this LSX swapped 86 right here in the LS1 Tech Forum! This car is truly insane, and it commands respect from just about anybody it crosses paths with! The blend of import sheet metal wrapped around an American mill makes for a confusing situation if you're not prepared for what you're about to witness. Aside from the Kevlar overfenders (and multiple induction scoops littered along the back half of the car), there's not much to indicate a massive powerplant is waiting to twist the axle shafts into euphoria - unless you know what you're looking at. They always told us not to judge a book by its cover. While that mantra may or may not be applicable to all aspects of our lives, it couldn't be truer here. Even if you did notice the big brakes behind the spokes, the rear-mount radiator - all the telltale signs there was something sinister hiding under the hood - nothing can aptly prepare you for what you're about to see when it actually comes off! 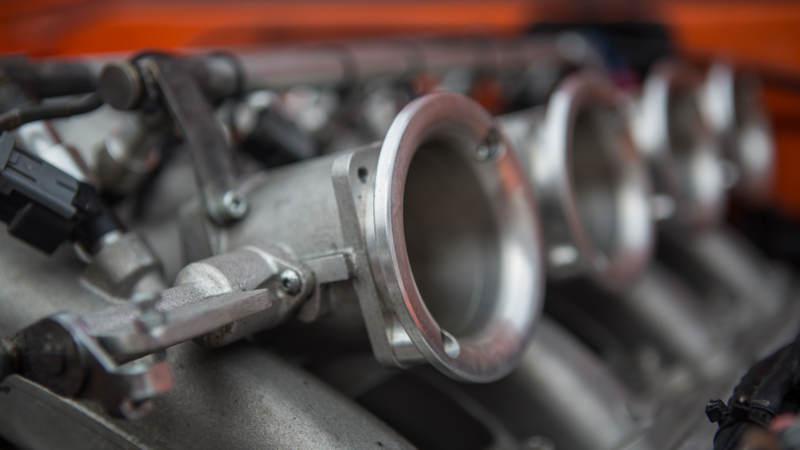 A set of Jenvey throttle bodies line the intake, crowned by a high-pressure fuel rail, complete with a few AN fittings to finish off the look. Not a lot of show here; no chrome, no custom paint - it's all motor; it's all business. In its current setup, the LSX mill express-delivers 646hp to the wheels, making quick work of just about anything in front of you; straightaways, s-turns, hairpins, Ferraris, Lamborghinis...(ok, maybe not Ferraris and Lamborghinis). 646hp and 640ft/lbs of torque sound good right? Better than what most people can lay claim to - but what does that exactly mean? It's pretty hard to quantify the effect that so many ponies can have on a 2,740lb car, without seeing it in action. That's why we had to showcase the cumulonimbus-generator in action; we could talk for days about it - but look at that smoke though! Driftworks isn't shy about showing off. In fact, they revel at every opportunity to do so (which is fortunate for the rest of us, because more smoke is always better than less smoke, right?). We're not talking about liability insurance either (although, that may not be a bad idea)! The car is an old design. It's a great design, don't get us wrong; but safety has come a long way since the AE86 started rolling off the assembly lines, and when it did - the chassis was never intended for 100-plus mph entry speeds, chassis-bending torque numbers, and g-forces attacking it from all angles. Side protection was critical in the design. So critical, that the line between racecar and road car quickly blurs as you step over the tubular cage and sink into the Cobra racing seats. 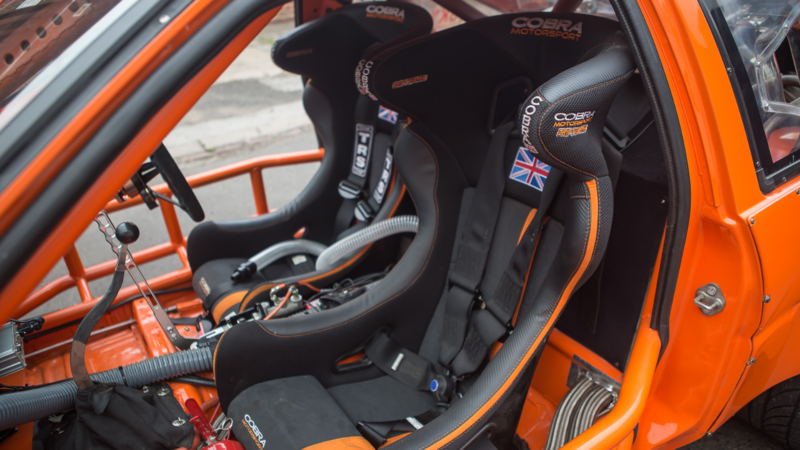 Inside is somewhat familiar to most of us; we've all torn out the interior on something we've owned, at one point or another, to try to "emulate" a weight reduction - but few of us ever followed through to this extent. The lack of factory panels simply made room for a bunch of race peripherals that litter the inside of the passenger cabin. Vented helmets require ducting, rear-mounted radiators require plumbing; yet, despite all the race-utility going on in between your legs, the impression is still bare-bones - only the absolute essentials are left from the previous car - often amounting to nothing more than whispers of the car it once was. One does not simply install an LSX, and shred tires. (But they kinda do.) The AE86 build would be no ordinary GM mill, however. 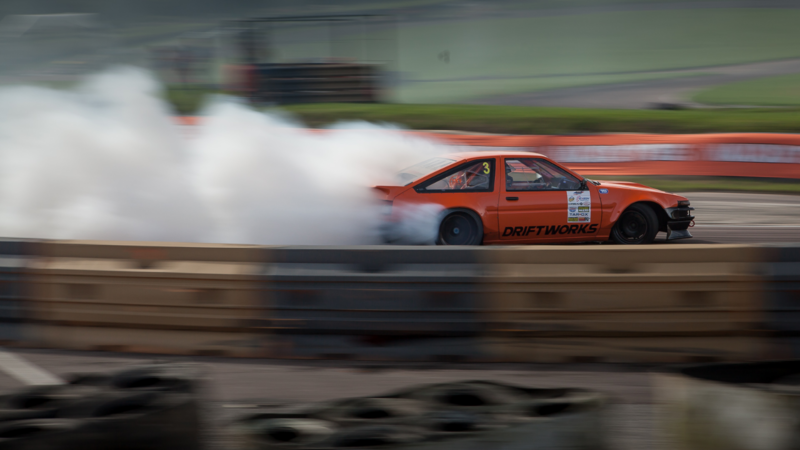 From the factory, it was optioned out as a full-on race motor; but Driftworks didn't stop there. 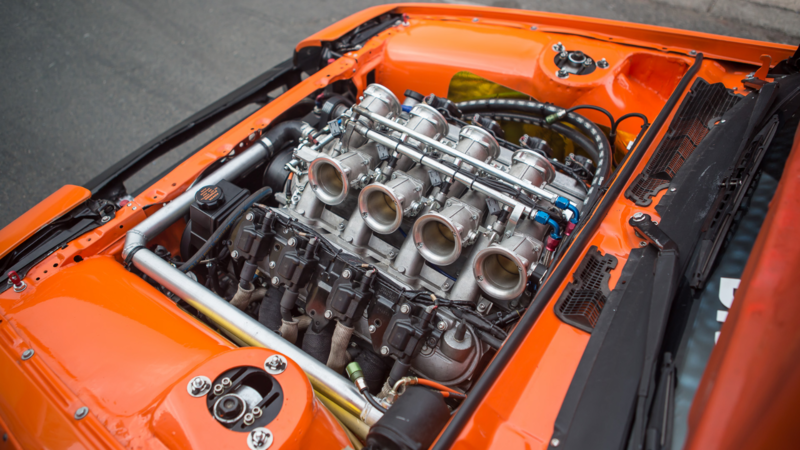 The custom-ground camshaft gives the titanium springs and retainer kit from Manley something to hold on for, while an ARE dry-sump kit keeps everything wet. An aluminum Driftworks radiator is fed - indirectly - by the Davies Craig water pump as it pushes coolant through the engine on its way back around. As previously stated, you don't just "stuff" big power inside a tiny car and expect to live to talk about it. While it may be the familiar AE86 we remember from the '80s (from far away), a closer inspection finds anything but familiar! The Driftworks CS2 coilover setup helps maintain suspension geometry as the car catapults across a myriad of different road surfaces (perpendicular to the vehicle's direction of travel, I might add). 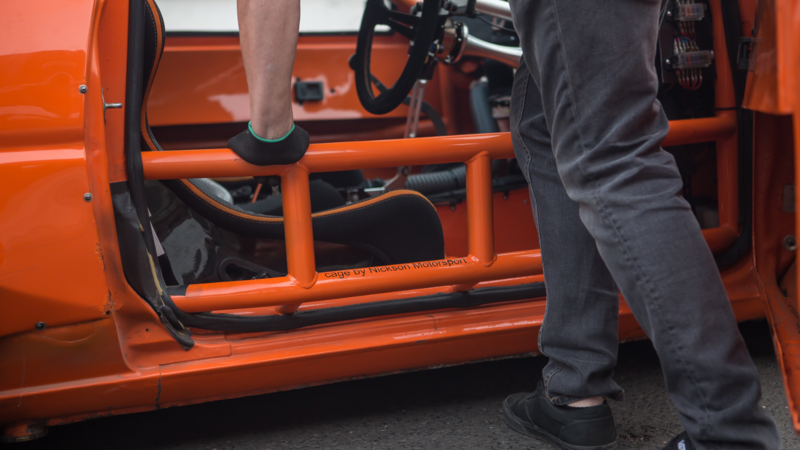 Beefy racing rollbars are tucked in between the maze of four-link arms and tension rods. Masterbiter brake pads transfer brake power from the Wilwood pedal box - but the Knuckleduster handbrake handle implores you to use your hands, more often than not! 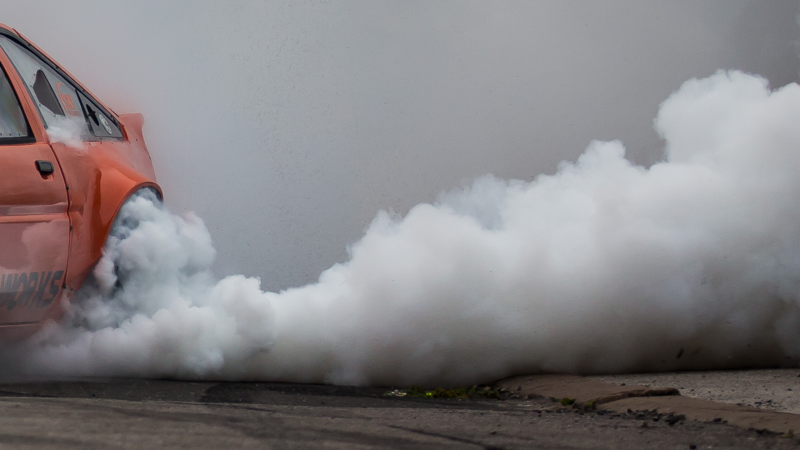 Now that we understand a little bit more about the witchcraft going on beneath the surface of this once-humble Toyota, it's much easier to understand why Driftworks can't get a set of rear tires to last longer than 35 seconds. It may have confused you with the throaty V-8 rumble before you knew what was inside of it - but now you'll know exactly what to expect if you're ever fortunate enough to experience it in person. Well played, Driftworks.